Published: Jan. 5, 2016 at 02:50 p.m. Updated: Jan. 6, 2016 at 11:21 a.m. The Steelers escaped an early winter with Sunday's win over the Browns, but they could not escape some intra-squad beef. Steelers quarterback Ben Roethlisberger went on KDKA-FM in Pittsburgh on Tuesday to call out regressing wide receiver Martavis Bryant, who went AWOL in Cleveland. "Not that I'm shying from saying this (to Bryant). It comes from love," Roethlisberger said. "He needs to understand that ... at this time of year you have to toughen up. You have to make tough plays, you have to make tough catches and you have to find ways to do everything you can to help this team. Martavis Bryant talks Antonio Brown and Cam Newton, plus reveals Mike Tomlin's nicknames for him. "He was sick last week and that got him behind a little bit. But I love to challenge him. We all do. The sky is the limit for him. I want to challenge him to be the best in the world, and it's really up to him with what he wants to do with that challenge. "Does he want to crumble and wilt and pout and let it bother him? Or does he want to rise up, step up, say 'I'll take that challenge' and does he want to be the best in the world?" Finishing with just one catch for no yards, Bryant was noticeably absent during the Steelers' win after he left with a strained neck he suffered when making a tackle on Roethlisberger's first interception. 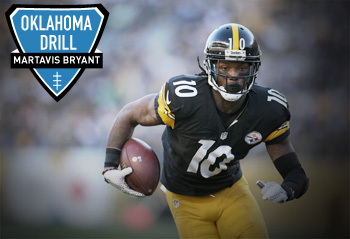 Bryant told ESPN's Josina Anderson he doesn't think the injury will inhibit him from playing against the Bengals. The Steelers' offense faired fine without the wide receiver. Antonio Brown put up monstrous numbers (13-187-1) sans Bryant, but that was against Cleveland's secondary, which bears no resemblance to the Bengals' stout pass defense. For comparison's sake, Bryant has just two catches for six yards in the Steelers' last two games, both competitive division contests. Pittsburgh will need a healthy arsenal of weapons on the outside and a tough mindset to outlast Cincinnati in what should be the testiest matchup of the weekend. So, like Big Ben said, Bryant better be ready.